While I ate my delicious cake, I wondered how it was made. You see, I consider myself a good cook and each time I see something nice, I try to figure out how it was made. If it happens to be something I can’t figure out then I may go and ask someone who knows. Sweet tooth like me, I learnt to make cakes early enough. I was a curious and inquisitive little girl. Everybody has that aunt who always claims to know how to cook everything on earth, right? Well, I do and I often ask her whenever I try to make something new and run into difficulty. I remember asking her about making chocolate cakes once. “That’s easy,” she said, “All you have to do is mix the paste like I taught you and add bournvita or milo to it.” I nodded in understanding. It seemed very easy. Ok, I’m sure you all know what bournvita is so I don’t need to explain. Suffice it to say that I spent many years believing that once you add bournvita to cake mixture then you have your chocolate cake ready. I had my doubts but I never really tried to find out if it was true or not. I didn’t try it though and it never occurred to me that there was actually something called cocoa powder which you add to the cake mixture to produce that effect. It’s years after and I’m sitting here, eating my cupcakes and wondering what other numerous things I accepted as truth in my childhood and have never quite unlearned even as an adult. You see, we human beings have a way of holding on tightly to the things people have told us in the past. I suppose the brain stores certain information from childhood that are very difficult to discard even at maturity. Just because our parents told us that people from a certain area are not to be trusted we accept it as a fact that cannot be changed. We have seen wars fought for years on end just because of half-truths told by our forefathers. We have seen hate established as culture and dehumanizing practices we refuse to let go of because our parents ingrained them in us. All hatred, racism, intolerance, ethnicism, prejudice and untold conflicts arise because of facts we accepted as truth without verification. Religion is not left out of the list. Have you ever tried to question your beliefs? No doubt you were told as a child that some questions are best left unanswered. That’s true! We may never figure everything out but have you ever tried to juxtapose some of the things you accept to be true with reason. If a ‘man of God’ asks you to do something, do you as a human being pass it through the rational part of your brain or do you accept everything hook, line and sinker? It’s is alarming to hear of ladies being asked to come to church without their underwear to enable the Holy Spirit free entry. Which Holy Spirit, biko? Is it still the one that we call Holy? They say you should drop your educational qualifications and degrees when you come to church. Really? Do you know how knowledgeable and wise Solomon was? Was that wisdom not given to him by God for good purpose? Why then should you as a Christian decide to drop your ability to reason and make deductions which is what education does for you just because you are a Christian? Even God gives us room to reason with him. He says, “Come now let us reason together. Though your sins be as scarlet. They shall be white as snow.” I always encourage people to ask God to reveal his truth directly to them. Moreover His word is there to guide you. Anything that seems unscriptural to you, no matter how wonderful it sounds should be discarded. 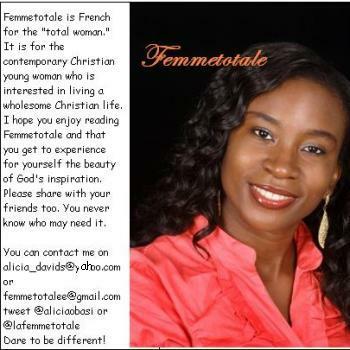 You want to be the Femmetotale? Start filtering information and verifying things before you accept them as truth. Filter the dogmas your culture and family have ingrained in you and be the God-kind of woman. In the mean time, let me finish my delicious cupcakes and please stop salivating. Thou shall not covet thy neighbour’s cakes, remember… lol! Madam!doing wat u knw hw 2 do best….xcellent writeup…bt im cuming 4 my own cupcakes ooo,permission 2 convet….lolzzz. the “God told me syndrome”.. if God told you about me, He should tell me about me too, after all its my life. thats why we need to test the spirits and know if they are real, compare what anyone says with God’s word to know if its true..
that’s why we need to know God for ourselves, have a relationship with HIM and not swallow everytin from the mouth of another human like us. Well said dear! And those cupcakes…..sumbit mine or? Nice, nice. I just smile when I see young ladies who are interesting, smart, beautiful and love God. You’re one of them. Great post…. kai we’ve been told many things as kids and even now we still act like kids by believing everything ‘when I was a kid, I thought like a kid but now you are an adult…. biko nu think like one’ We should test all spirits and pass it through the Word of God. Thumbs up dear meanwhile I now know why you registered ur arrival in Yoghurberry. Mehn!!! The chocolate flavour made sense!